As in many areas of the Ashmolean’s rich collections, only the British Museum in this country has a comparable holding of Japanese paintings. Individual paintings from the Ashmolean have been included in exhibition catalogues and in surveys of Japanese art but this is the first catalogue of the Museum’s Japanese paintings. It has been undertaken with great skill and sensitivity by Janice Katz who was with us in Oxford for two years as holder of the Sackler Fellowship at Worcester College. She has now joined the staff of the Art Institute in Chicago. We are immensely grateful to Mortimer and Theresa Sackler for their support of this Fellowship by means of which a scholar comes to Oxford to work on an aspect of the Ashmolean’s collections and enjoys the privileges of a graduate member of Worcester College. Ms Katz has made a selection from the Ashmolean's 430 Japanese paintings, presenting the sixty finest in detail and illustrating and commenting on a further one hundred in order to invite study by other scholars. I would also like to record my gratitude to Oliver Impey, who is retiring this year, having served with immense distinction as Curator of Japanese Art at the Ashmolean since 1968. 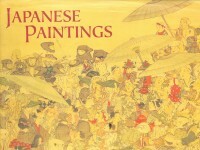 The collection of Japanese paintings is just one legacy of Oliver’s devoted service to the Museum. He has acquired two- thirds of all the paintings catalogued in this volume as well as an enormously important group of screens which are not included here as he himself has published most of them in his volume, The Art of the Japanese Folding Screen. I know that Janice Katz has benefited from his great knowledge of Japanese painting and his wise advice in the compilation of this catalogue.